The Seventh Scare of this Christmas is a drastic departure from the kindly old, gift-giving lady of the Befana. Readers, meet Gryla, an Icelandic giantess of myth, whose legend dates back to at least the thirteenth century. Her legend last for centuries, and became associated with Christmas sometime during the seventeenth century, when she became known as the mother of the Yule Lads, who will be chronicled in their own post here at the 12 Scares of Christmas. Gryla's legend dates back to the "Edda," which was a thirteenth century written account of Old Norse prose and poetry, which is the main source of what we know today as Old Norse mythology. The legend of Gryla, as it was come to be known, goes something like this. Throughout the year, from her mountain cave home, Gryla can detect misbehaving, bad children. At Christmas she comes out of her home to eat bad children. End of story. 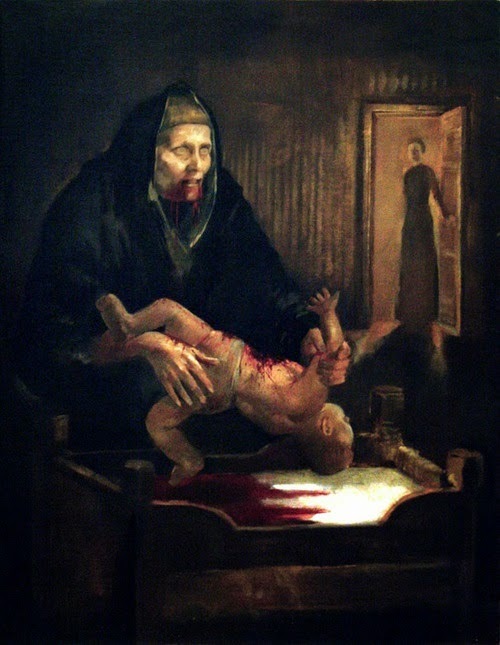 Gryla eats children. As evidenced in this painting below.